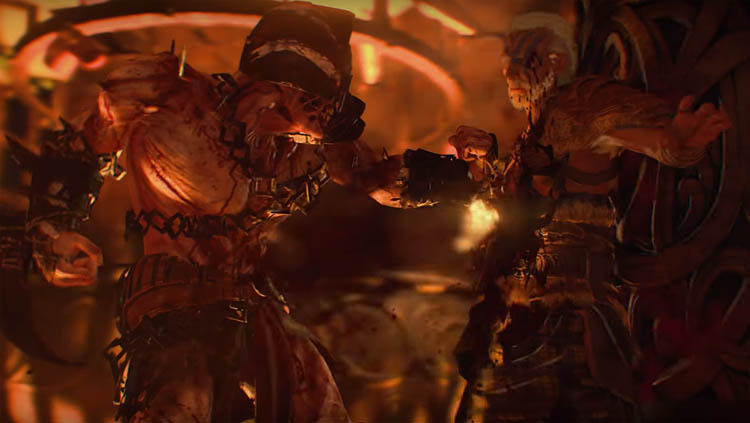 Welcome to the Easter Egg guide for IX, the medieval zombies map for Black Ops 4. This guide contains all of the main EE steps including screenshots, puzzles solutions and map locations where appropriate. 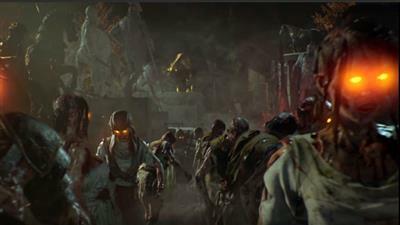 Before launch, Jason Blundell described IX as the beginners zombies map in Black Ops 4 with an entirely accessible Easter Egg that's suitable for new and returning fans. The map itself has the most straightforward layout of the four launch maps but don't let that put you off because IX is a very entertaining experience. To kick-start the EE you're required to build the Pack-a-Punch (PaP) and Death of Orion Wonder Weapon fairly early in the game. Although the PaP is straight forward enough, the Wonder Weapon does have a multiple step process. For those of you that like to play SOLO - I can 100% confirm that this EE is possible SOLO. There will only be two God areas unlocked at the start of the game but two more can be unlocked later with more points. Inside an Altar room is a gong. Activate the gong to ring a bell and summon a Champion (mini-BOSS zombies) - these are very strong zombies so make sure you're ready. Kill the Champion zombie and collect the head from the center of the area (on top of pedestal). Repeat this process four times: going to a God Altar room, activating the gong, defeating the Champion and collecting the head. Eventually you should have FOUR heads in your inventory. Venture underground into the Temple (through The Pit room which looks like a flooded crypt) and find the incomplete PaP Altar in the center of the room. Interact with each of the spikes on the floor, as the on screen prompt says "Hold to feed the altar", to place a head. After all four heads are placed the PaP is unlocked. Chain - walk through door leading to Temple from Danu-Ra Entrance to Temple, take immediate left and inside little room, the chain is hanging on the flaming torch. Metal Cog - diagonally opposite the little room for the chain, go past PaP, swing a little left inside next room, Cog is underneath the cage with the skeleton inside. 2. Shoot the bowl. Face the Pap, turn 180 degrees and continue straight until you're inside Danu-Ra Temple Entrance. Look for the metal gate that's blocking a passageway/window and shoot the flaming bowl in the distance with PaP weapon or frag grenade (see top right of image above). 3. Find the Head. Go above ground to the Stone Bridge between the Ra and Danu temples. Look over the edge into the starting arena and note where the flaming arrow is pointing (see bottom left corner of image above). Go to that God location and collect the head. Exact locations are: Danu Tower Arboretum: in the water, Ra Tower Burial Chamber: in a fire pit, Odin Tower Cauldron: under the actual cauldron, Zeus Tower Bathhouse, in the corner of bloodbath room. 4. Build the Acid Trap and get Scorpion part. Go to the walkway entrance of any temple from the spawn arena, build the Acid Trap and place the head on the metal grate on the floor. Wait for trap to activate then collect the Scorpion part. 5. Get a positive Crowd Affinity and reward. To do this get lots of kills in the arena with your special weapon and don't get hit. You should get a green thumbs up icon on the bottom left of the screen and after tons of kills the announcer will say "A gift from the gods". Look on the floor of the arena for the gold pot reward. 6. Go to the Danu Tower Arboretum (lower level), place the Scorpion and Golden Jar next to the tree (see bottom right of image above). Note, you must interact with the hole in the tree to place the Scorpion and the base of tree for jar. Get kills and end the round, then pick up the jar from the floor. 7. Poison the mystery box. Got to the mystery box and interact with the left side of the box to donate your jar and poison it. Wait a few seconds and collect the Death of Orion from the box. The following steps relate to the Purge the blight objective. Go to the starting arena and wait for an axe wielding zombie to spawn in. Tempt the zombie to throw his axe at one of the pyres (wooden log pile with body on) and break off wood. Collect the wood from the floor. Take the wood to Odin Tower Cauldron and place inside the cauldron. Wait approx 3 rounds for the wood to turn into charcoal. Pick up the charcoal and your character should say how hot the coal is. Next, we need to find a skull with a faint blue symbol on it's forehead and dislodge it using your characters specialist weapon, then pick it up. The skull is typically found embedded in a wall with many other skulls, ALWAYS in the vicinity of the PaP room. Note, you MUST complete the Wonder Weapon step before the skull will fall off. I'm not sure if it's a glitch but this is one of the most unreliable EE steps in recent memory. I recommend that if the skull really isn't there then restart your game and try again - it's not worth the hassle looking for hours on end. Once you have the skull, go to the Flooded Crypt room and look for the grinder which is embedded into the wall (see bottom of image above). Use 3 x fully charged shots from the Death of Orion Wonder Weapon to shock the grinder and activate it. After a few seconds collect the item again. For the next step you're going to return to the spawn arena and upset the crowd by throwing 3 x grenades at them. They should throw poop at you - pick it up. Go to the Zeus Tower Bath House and place the poop, bone and charcoal in a bowl near the bloodbath and curtain (see top of image above). Wait approx two rounds until the mixture is fertilized and pick it up again. Next, head to the Danu Tower Arboretum (where you placed the Scorpion and Jar for Wonder Weapon) and place fertilizer on the floor between the two trees. After approx 3 rounds the fertilizer will smoke green. At this point, use a PaP'd weapon with the Firebomb effect (keep using PaP machine to get this bonus effect) to get kills right on top of the smoking green fertilizer until the floor turns a bright blue colour. Now stand still on the blue symbol for about 10 seconds and if done correctly, you should be teleported to a much darker version (black and white) of the Danu Tower. Survive the zombie onslaught whilst moving between the levels and shooting the glowing red spores on the tree. If done correctly the quest objective changes to Answer the Dawn. You can build the shield at any workbench on the map. A good workbench location is in The Pit. Although this step is placed here, it's a good idea to build the shield much earlier in the game, ideally when you're unlocking PaP. Now that you have the shield it’s time to use it to shoot the FOUR bulls around the map. Successfully hitting a bull will set it on fire. A Champion will spawn into the map, kill him to collect his soul into the Ra statue. Note, the bulls don't look much like bulls so check image above for appearance. Now commences the obelisk step. Return to the Ra Tower Altar (upstairs) and take note of the blue symbol on the obelisk. Get all players to hold square in front of the symbol to be teleported to an alternate version of the Ra Tower and watch very carefully for the four symbols that flash on the obelisk. You must kill the different zombie types in the order determined by the symbols, otherwise the challenge fails and you must wait for a new round to try again. You ARE allowed to kill normal zombies BUT all special zombies must be killed in the right order. Another four symbols will appear on the Obelisk once the first set are done. Repeat the process again for the new set of symbols. Once complete the quest objective changes to Summon the Storm. First, have all players stand in the middle of the arena and teleport underground. Now return to the arena and get all players to interact with the stone in the middle to be teleported underground. Return to the arena again and take note of the various electric/lightning orbs that have spawned in the corners. You must use your PaP'd weapon with the Kill-O-Watt re-pack effect to ensnare zombies and obtain the Kilowatt status (notification on bottom of screen). Kill the stunned zombies inside the circles near the electrical orbs and souls should be visually collected if done correctly. Fill all of the electrical orbs until they move into the center of the arena. Have all players stand on the platform and interact to be teleported. The exit gates of the arena will now lock and tons of gladiator zombies will spawn into the arena. Thankfully you have unlimited special abilities during this step. Simply survive for a few minutes and the challenge is complete and the gates reopen. The quest objective changes to Channel the flood. The key is to shoot three symbols at a time with one blast of the Serkets Kiss (upgraded Wonder Weapon). If done correctly, the three symbols will stay lit otherwise they will fade back. Don't worry about shooting through walls, just make sure you've got a direct line to the three symbols. Tip: If you have other players in your game, get them to stand beside the symbols and use their silhouette to line up your shot. Get every player to The Pit and stand on the metal grate at the rear. You should hear a slight clink sound. Shoot a specialist weapon at the metal grate and all hold square to be sure. If done correctly, the screen fades to white as before, and you must now survive an onslaught of zombies as the water rises. Looking through the metal grate allows you to check the progress of rising water. Defeating the final two Blight Fathers will complete this survival challenge. 13. Myriad warrior awaits - BOSS fight! Congratulations you are now just a BOSS fight away from completing this Easter Egg. Now is the last chance to stock up on ammo and perks. The central area of the arena now has a portal that leads to the BOSS fight. Take the portal and the screen fades to white and you're teleported to a large arena. Tons of enemies will now spawn into the area so use the space wisely to stay alive and take every max ammo you find. Eventually you'll see a zombie elephant spawn in, hit the armour to knock the rider off. Once the rider is knocked off, aim for the elephants forehead which is now the weak point. Once the first elephant is down, a second stronger one spawns in. Again, aim for the armour first then the forehead. Defeating the second elephant will complete the BOSS fight and start the cutscene. 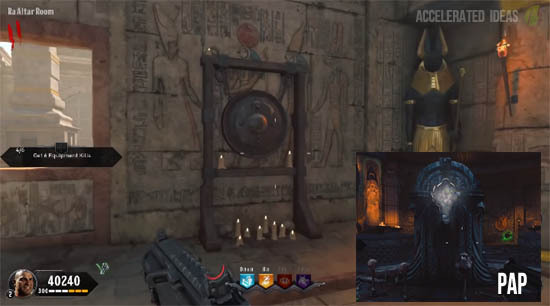 Congratulations you have now completed the Easter Egg for IX!! The EE is now complete. This guide will be updated with any corrections and improvements in the coming days. Thanks for joining the race once again and congratulations to Milo, Smartguy and Liam for world's first.